While not necessarily represented in this photo, the Festa al Lago is still loaded with big names. Day 3 of the WPT Festa al Lago wrapped short of the money with 37 total remaining. Corwin Cole took the chip lead by the end of the day, stacked at 996,000. But the bigger and completely manufactured story by us is: can a married couple make the same WPT final table for the first time? Dee Luong, a woman, is among the big stacks with 771,500. 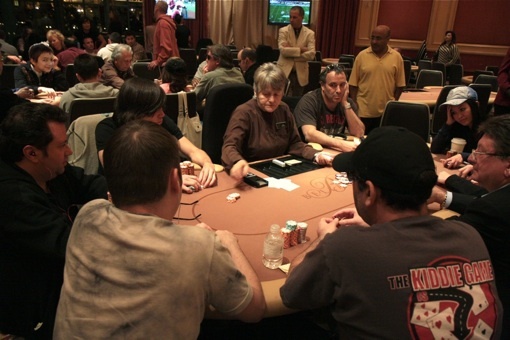 She is married to Prahlad Friedman, who is among the short stacks with 188,000. While a long-shot from actually happening, if watching years of Lost has taught us anything, it’s that anything can happen. 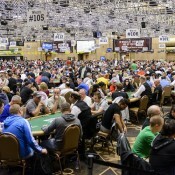 Lots of big names remain, including Mark Seif (759,000), yesterday’s chip leader Jason Somerville (669,000), Dutch Boyd (616,500), half-man, half-amazing Freddy Deeb (588,000), Chris “Jesus” Ferguson (535,000), Matthew Stout	(498,500), Brandon Cantu (414,000), Kido Pham (401,000), Dan Shak (398,000), Johnny “Cliff Josephy” Bax (385,000), Andy Bloch (320,000), Falcon Heene (310,000), Chau Giang	(293,500), Lee Markholt-Watkinson (273,500), and Vivek Rajkumar (253,000). That’s pretty much the majority of the field.